The Property has an open aspect with a large sunny garden, with full gas central heating. It also has ample off road parking with a large garage which can be used to dry wet suits and store equipment such a kayaks, surfboards etc. The property sleeps 5 and 1 infant under 2, in 3 bedrooms, 2 downstairs, one with 2 singles and the other a single, whilst the third bedroom with a King bed is upstairs. The kitchen is modern and well equipped with a gas hob, electric oven, fridge-freezer, washing machine, dishwasher and a microwave. The living room has ample room for five persons and is equipped with Freeview TV, a dvd and Wi-Fi. Linen and towels are provided (Please provide your own beach towels and cot linen), gas and electricity are included in the price. The bungalow is situated in a Cul De Sac in the rural hamlet of Cuffern approx. 1.5 miles from the village of Roch which has a shop, post office and local pub. 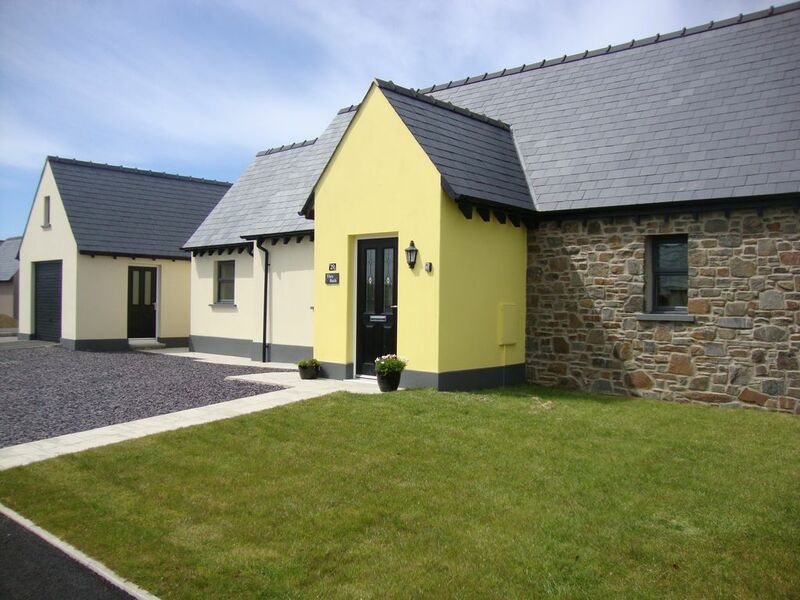 It’s on the edge of the Pembrokeshire Coast National Park just 10 mins. from both the beach at Newgale which has areas set aside for surfing, wind surfing, and kite surfing etc, and the sandy cove of Nolton Haven, both give you access to the Pembrokeshire coast path. The bungalow is centrally located in Pembrokeshire in an ideal position to tour the county, with lovely coves and beaches to explore, great pubs to relax in and the scenery isn’t bad either. The pretty harbour of Solva, and the county town of Haverfordwest are both close by, whilst St. Davids is 20 mins. away. The bungalow really is ideal for families, with ample room for children inside and out. It's also perfect for those just wanting to relax. as well as those who are looking for something active, with coasteering, surfing, kayaking and walking all available close by. Large garage suitable for large car or as storage space for canoes, bikes, kite-boards etc. or a 16ft boat. Can also be used as an undercover play area. Roomy, clean and well equipped! We recently stayed here over Christmas and loved it. It was super clean, had everything you could possibly need and was much bigger than it looks in the pictures. They even decorated it for Christmas which just goes to show how considerate the owner is. Would definitely stay here again. Lovely clean well equipped bungalow. Having stayed in lots of properties in Pembrokeshire this is one of the best. Immaculately clean, comfortable and spacious, the photographs don't do it justice. There is everything you would need, including a hairdryer! The location is excellent, just 10 minutes from Newgale. We arrived on December 27th and the house had been decorated for Christmas, which was a lovely touch. The owner was extremely helpful. All in all an excellent break. Can't recommmend enough. As everyone says, a spacious and well equiped property, would recommend it to anyone. Excellent property, excellent facilities and fully equipped. A great holiday. The bungalow was spacious as advertised. We actually found the lounge area bigger than the photos. Had all the utensils and appliances you will need. All you need to do is provide the food. Really enjoyed our relaxing stay. We found the location great for exploring both the north and south of the area.